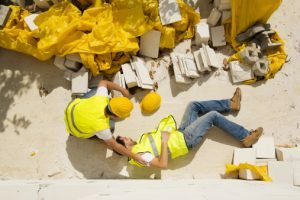 The United States Department of Labor has released its Census of Fatal Occupational Injuries data on 2016 workplace fatalities, and the greater Boston area is notable for a significant increase from the year before. In fact, Boston’s workplace fatalities in 2016 reached levels not seen since 2000. This stood out in comparison to a much smaller increase that happened in workplace deaths across the nation, which resulted in a national workplace fatality count that reached over 5,000 for the first time since 2008. Wicked Local Westborough reports that Boston area workplace deaths have stayed under 50 per year for the last decade, reaching a low of just over 20 in 2012. 2015 came close, at nearly 50 workplace fatalities, but 2016 skyrocketed up to 75. Where the national average saw a 7 percent increase in workplace fatalities, Greater Boston saw a 56 percent increase. Construction and extraction occupations claimed the most lives of any industry in Greater Boston, at 24 workplace fatalities. While transportation incidents were responsible for the largest number of workplace fatalities nationwide at 40 percent, other factors were of particular note in the Boston area. These included exposure to harmful substances or environments at 19 deaths, and violence and other injuries by persons or animals with 17 deaths. The harmful substances category includes deaths related to unintentional overdose and the non-medical use of drugs and alcohol. Federal reports indicated a spike in these numbers due in part to opioid-related incidents. Within the category, the subcategory exposure to other harmful substances jumped from 5 to 16 fatalities. Massachusetts has made strides to see these numbers change. With Gov. Baker extending OSHA protections to public-sector workers and recent laws raising the maximum fine for corporate manslaughter from $1,000 to $250,000, it is expected that we will begin to see more care taken to protect a larger range of employees. However, with a very small force of OSHA inspectors in the commonwealth, it may be difficult for the government to hold each employer directly responsible. In this environment, it is deeply important that workers who are injured on the job hold their employers responsible quickly and effectively. You may be eligible for workers’ compensation. That’s why it’s best to speak to an attorney at The Law Offices of Deborah G. Kohl to discuss your options. This entry was posted on Tuesday, July 17th, 2018 at 5:05 pm and is filed under workers' compensation. You can follow any responses to this entry through the RSS 2.0 feed. Responses are currently closed, but you can trackback from your own site.